When putting together this website of mine, I had no intention of reviewing fiction. However, in this collection of Women in Literature, I decided to relent this time. Editor Susan Cahill has also included "memoirs" so I thought I'd give it a go. Admittedly, I didn't read everything (poetry doesn't hold my interest that much) and so only touched on the likes of Mary Shelley, Zora Neale Hurston, Maya Angelou, Edna O'Brien, Sylvia Plath, and a couple of others. A line in Lady Mary Wortley Montagu's (1689-1762) letter to her daughter has an interesting line in it: "Ignorance is as much the fountain of vice and idleness, and indeed generally produces it." Even in those days! This is a line from a letter to her daughter advising her to encourage her daughter to read and learn - intriguing, for in those days (and many beyond), it was not considered "proper" for young girls to be educated. Each writer writes in an enviable style and on vastly different subjects. Now I can go back and pick any author I fancy reading and have a read whenever I feel like it. 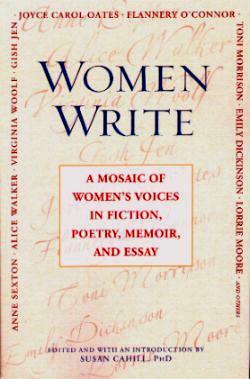 Some of the other authors included are Emily Dickinson, Edith Wharton, Virginia Woolf, Muriel Spark, Nadine Gordimer, and Alice Walker. This is a great book to have if you want to sample some of the greats - you might want to delve deeper. Conclusion - Very interesting and eye-opening and amazing.